Sometimes the small details add much more to the big picture than anticipated, and this is definitely true when it comes to using area rugs in your home’s interior design. Not only do area rugs add a level of personality and color to a room, but they also contribute to the overall style of your entire home. Whether you need to spruce up your living room or decorate a home you’ve just moved into, area rugs can set the tone for any given space and tie a decorating theme together. Smaller area rugs can be used to accentuate your favorite pieces of furniture, such as a round rug beneath an antique table or your coziest recliner. Large area rugs are perfect for making a bold statement in dens, family rooms and bedrooms, whether you choose to go with a traditional style or the more modern look of contemporary area rugs. If your home has hardwood floors, protect them from unnecessary scrapes and scratches when you place area rugs in high traffic areas. Large rugs or hallway-sized rugs can add to your hardwood floor’s lifespan. Well-made area rugs will also increase in value over time, providing an additional bonus to you as a homeowner or even as a renter. 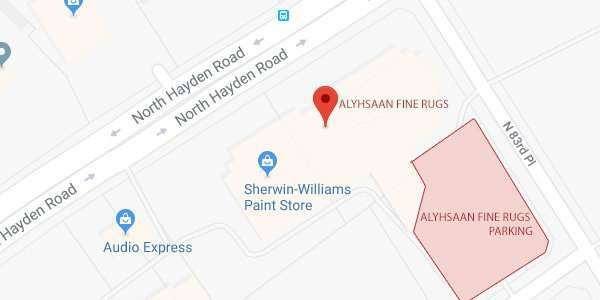 Learn from the area rug experts at Alyshaan Fine Rugs to find the perfect complement to your home decor, whether you live in Scottsdale, Phoenix or anywhere else. With over 4,000 area rugs in scottsdale stock, our knowledgeable staff can help you choose the best style, material and type of area rug for your needs. If you have a decorating budget to keep, don’t fret! We directly import our rugs, cutting out the middleman, so we offer rugs in several price ranges to accommodate any budget. Visit our storefront in Scottsdale today to see our selection for yourself! Find us at 15125 N. Hayden Road, #110 or call ahead at 480-607-4955 to see if we have what you’re looking for in an area rug.